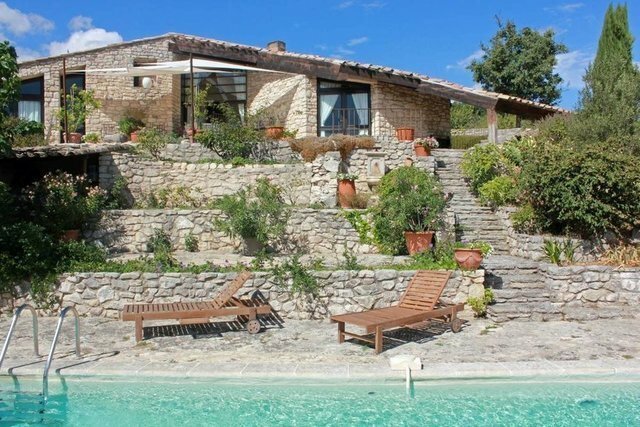 Near Gordes, away from the tourist trail, contemporary house from the 1970s.The house was built on land offering superb views over the Luberon. Partly landscaped garden and partly scrubland (mainly oak) of about 1 hectare.South of the house, a swimming pool has been built on a lower terrace. One level property comprising a fitted kitchen, a large lounge, dining room with fireplace opening onto a lovely terrace, three bedrooms a bathroom, two shower rooms and a storage room.North of the main house, a guests house of approximately 100 sqm benefiting from two bedrooms, two shower rooms and a living room with kitchen. Attached to this annex, a large garage, a workshop and a cellar.Great opportunity, this property has easy access and is located in a totally protected environment.